On the afternoon of 7 September 2018, Geoff and I made a trip north to Harrier, an area of croft land on Foula, Shetland, in order to follow up on a bird that had eluded me in the irises the previous day. We were both a bit leg weary after a rigorous morning of birding on the island – however, we agreed to carry on, and cover the area where the mystery bird had vanished the previous day. We decided the best tactic was to split up; Geoff would take on the uphill section, with me heading across the land. I made my way to a small, square-walled 'crub', which contained stunted trees and shrubs. I scanned the area, and sat on the wall was what I initially thought was a Reed Bunting, based on the well-marked facial pattern. I managed to get a bit nearer (approximately 15 metres away), and suddenly I saw a yellow patch in front of the eye, and a white throat! I knew I'd seen this feature before in an adult White-throated Sparrow, also on Foula, in 2004, but the overall impression was that this was a much less striking bird. I quickly grabbed my camera and managed to take a few photos. I spun around and managed to get Geoff's attention, but, alarmingly, as I turned back, the bird was gone. Geoff soon arrived and I relayed the sighting and showed him the images. We anxiously searched for an hour, hoping the bird would reappear, but there was no sign of it. We decided to head home to refuel and put the news out, before eagerly returning to try and locate the sparrow. It was with huge relief that, after another sweep of the area, the bird flew out of a patch of nettles and settled briefly on the wall of a ruined croft house. In less than a minute it flew into the building, and seemed to disappear again. It was now late, and time to go home and take stock. With only two very brief views of the bird, it was the series of photos that helped confirm the identification. However, we were left with an unanswered question – was it a 'tan-morph' adult or a first-winter? With limited experience and reference material we considered the latter to be the most likely, due to the large amount of streaking on its flanks and breast, as well as the supercilium and median crown stripe and throat being somewhat dull. The lateral crown stripes began black and fine, then behind the eye became rufous, broader and more irregular. Apart from a bold white throat with faint malar stripes, the head markings were ill-defined and messy. White-throated Sparrow, Foula, Shetland (Geoff Atherton). The experience of the White-crowned Sparrow from last autumn was helpful to draw comparisons. Apart from the difference in plumages, both birds looked plump, long-tailed and drooped their wings. Also, both sat still for brief periods but could disappear only to be found quite some distance away. The following day we managed to re-find it back in the crub, but boy was it difficult to see! Geoff crawled into the dark, thick undergrowth, where he eventually saw it moving about in the lower branches of an alder. Despite this disturbance the bird stayed put, and would've remained unseen – and presumed gone – had we not persisted. We let it be, and returned home to submit the news of its continued presence. 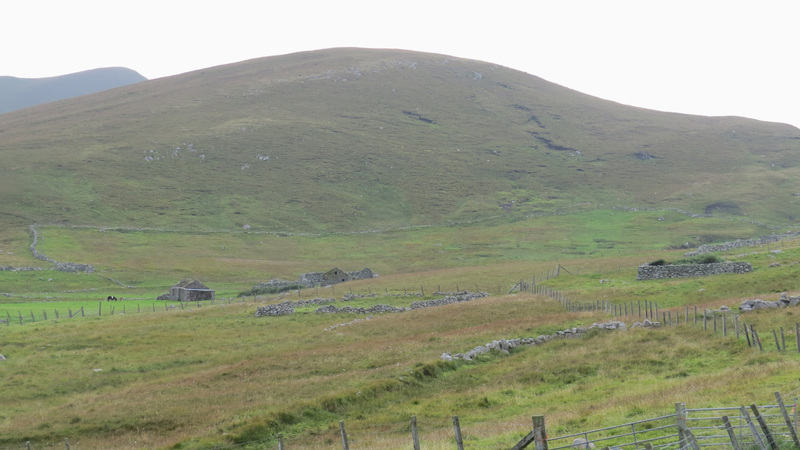 The 'crub' at Harrier, Foula, where the White-throated Sparrow favoured (Donna Atherton).